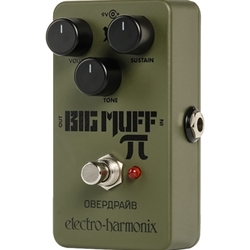 Back by overwhelming demand, the Electro-Harmonix Green Russian Big Muffâ€”in a mini package! The cult classic Green Russian Big Muff first shook the ground in the mid-1990s. Since then it has been heralded by guitarists and bassists for its devastating low-end and unique sludge and sizzle. The Green Russian Big Muff creates a huge tone that is all its own, but is undeniably Big Muff.